In a period when we've had high rains, it's very difficult to manage excessive winter growth in a Mediterranean climate. We're familiar with the term 'sheeping-off' for describing the use of sheep to graze alfalfa fields during the wintertime to remove thatch, weeds, and help with weevil control (see ‘Sheeping off' alfalfa is a win-win for all!). But how about 'goating-off'? Doesn't sound quite right, but close winter grazing by goats is likewise an effective pest management practice, just like sheep. When grazing with sheep or goats, timing is important. Watch for excessive soil compaction when rainy and wet and do not over graze alfalfa fields or damage to the crowns will occur. Goats grazing an alfalfa field, Yolo County, 2019. Browse or Graze? There are some differences between goats and sheep in their grazing habits. Goats are natural browsers and will often eat twigs, vines leaves and shrubs, but often prefer the tops of plants. Sheep are closer grazers, eating short, tender broadleaf plants, grasses and clover close to the ground. Small grasses such as annual bluegrass are great for sheep, and they will graze them down. Goats are little more selective, but will also consume a little more mature weeds. Both sheep and goats can graze too closely if they are left in the field too long, and can harm alfalfa stand through trampling of the crowns and buds, and through soil compaction. A Sustainable Option for weed, disease, insect and rodent Management. There is a real benefit to grazing off the winter growth with either sheep or goats. This not only removes excess winter growth (reducing the possibility of foliar diseases), but also removes emerged weeds. For example, Sclerotinia (White Mold) is a disease that results from a heavy canopy in the winter period-an open canopy will help to prevent infection. Removal of this canopy exposes voles and gophers to owls, hawks and other predators so they can 'do their thing' and reduce these pest populations. There are many aggressive winter weeds that are nonetheless very palatable and acceptable as goat or sheep feed. The well-established alfalfa can then come back in the warmer spring period and shade out broadleaf and grassy weeds that have been eaten and suppressed by grazing. Weevils. The consumption of alfalfa stems in the winter period is an important control measure for controlling alfalfa weevils that emerge in February (we have data that illustrates this from the Imperial Valley). Alfalfa weevil eggs are typically laid in mature alfalfa stems in December through March, and if consumed, they do not emerge to damage the first-growth alfalfa. Managing Animals and Avoiding Bloat. This particular field had quite a bit of mature growth but also young sprouts coming up. 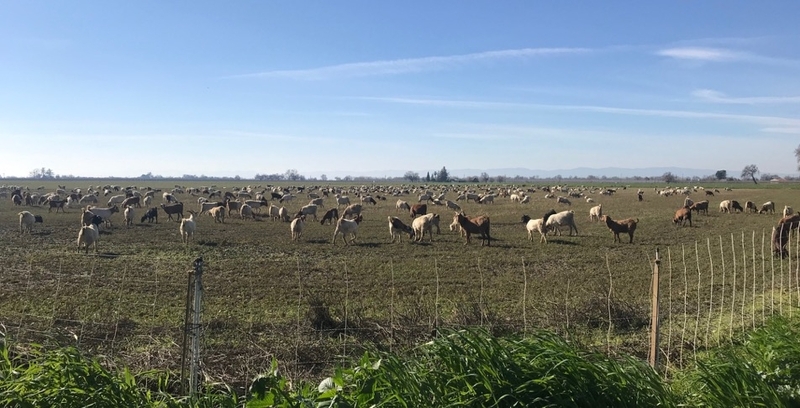 "The bottom block of that field wasn't harvested late, so there was a lot of growth there, but also with a lot of harder, woodier stems" said Lee Hazeltine, who manages these goats in Yolo County. "We were also a little concerned about the younger growth coming up from below in terms of the risk for bloat, especially with the young lambs." The lambs may go directly to the younger growth, ignoring the more mature stems, increasing bloat risk. Goats tend to handle older, woodier stems a little better than lambs to, and are generally less prone to bloat. His purpose is to match the condition of the field to the types of animals he places there, whether sheep or goats. Incorporation of animals into an alfalfa production system at a time when hay-making is impossible, provides a beneficial use (to the animals and herdsman), but also provides a service to the subsequent crop growth. A Caveat: In all cases (sheep or goats), watch for excessive trampling and soil compaction that can harm subsequent regrowth. Although these winter-grown forages are very high quality, bloat is a significant health risk from winter grazing of alfalfa fields, and is a challenge for the herder. I heard that weed seeds consumed by goats and later excreted are not viable. Is this true? Do goats (and sheep) help reduce the seed bank of weeds? Related question, can sheep or goats bring in weed seed from the prior grazing site? Great question. The answer is - some of them, not all of them. That is, digestion takes care of some weed seeds not others. I would have to check with weeds people as to whether there is any evidence that in balance, grazing would reduce seed bank or not. I suppose that if some percentage of weed seeds are rendered non-viable, that it would reduce the seed bank. On the other hand, if seed is 'scarified' by digestion, it would enhance germination (some have evolved to pass through digestive systems of birds and herbivores). The last question is yes- sheep or goats can bring in weed seed, on hoofs, coats, and perhaps in manures.